The Bowler Hat-Peru's Fashion Statement? A very striking thing about Peruvian people, particularly the Quechua people of the Colca and Lake Titicaca regions, is their clothing. In today's world, where people in many countries are trying to appear westernized by wearing European style clothes, dying their hair blond or getting colored contact lenses, I was happy to see that the Quechua people are still strongly clinging to their own way of living. They continue to wear their traditional clothes on a daily basis, which for women, comprise of large colorful skirts and loose blouses. The women also grow their hair long and braid them and tie the ends with alpaca wool. And, the finishing touch is the bowler hat. Quite frankly, I was amused by the bowler hat, as every local lady or girl I saw, had it on. There were so many shapes and varieties of this hat, and some of the prettiest ones had beautiful intricate designs on them. I found out that the Quechua and Aymara people of Peru and Bolivia have been wearing this hat for several decades, since it was introduced to them in 1920 by the British railway workers. 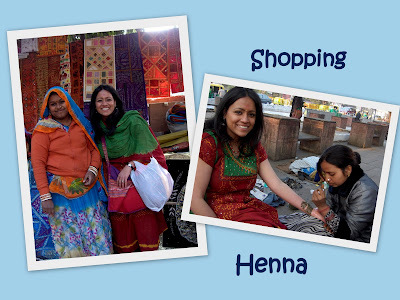 Ever since, this accessory has become part of their traditional wear, and is now manufactured locally. Our guide also told us that as it can get very hot in the lake region, the hat protects the people from sun exposure. Here, you can see photos of the hats! I even wanted to "fit in" with the Quechua ladies, and tried one on myself! I say, fashion designers should come to Peru to introduce the bowler hat as the latest "in thing"! You all probably know that cactus grows in the Central and South American region, and boy, did I see so many gigantic prickly plants of this species! The cacti I came across were mostly in the Colca region, and although they poke, they do make a pretty sight. I saw some local women displaying crates of red and green egg shaped fruits at their outdoor stalls, and I was curious to find out what they were. I found out that the cactus plant produces a very yummy, juicy, icy fruit called tuna. This fruit is also known as prickly pear and as I had never tasted it before, I asked the kind lady to prepare one for me. She peeled the skin and there it was, the bright reddish-pink fruit. The moment I put this fruit in my mouth, I was pleasantly surprised to find that it had a very light and sweet taste. It almost felt like I was crunching on crushed ice. It felt so cool and refreshing, and I bought a few more fruits to take back with me for the road trip to Arequipa. It definitely made for a much healthier snack than chips and cookies! Just writing about the prickly pear and looking at the photos make me desperate for one now! 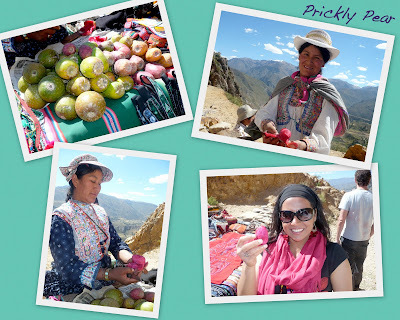 We started off our Peruvian adventure by visiting the Colca Valley region. After flying in to Arequipa from Lima with LAN, we checked into our Casa Andina Hotel. The hotel was very comfortable and well located in the city centre, plus the staff service was very good. 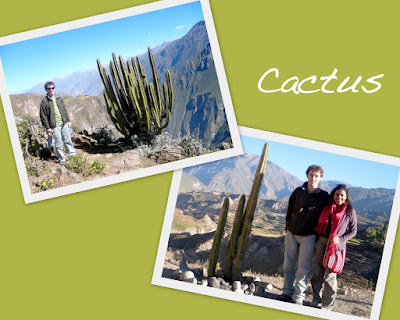 As we did not have any guided tours planned, we asked Casa Andina to arrange a two-day trip to the Colca Valley. After breakfast, a mini van came to pick us and few other people up. There were about 10 of us, and an English speaking guide. The drive to the Colca Valley from Arequipa was about 3 hours, and this was a truly wonderful journey. Firstly, the weather was simply amazing-just the way it should be on a holiday: bright blue sky and cool temperature (20°C). All along the way, we spotted llamas, vicugnas and alpacas roaming around in the vast drylands. I could also feel the presence of Volcano Misti, which dominated the entire landscape. Very picturesque indeed. We stopped a couple of times along the way for refreshments and toilet breaks, and had the opportunity to try cocoa tea. The Colca region has a very high altitude, and we were going as high as 5,000 meters above sea level, and some of us were starting to feel dizzy. Cocoa tea apparently has some special powers and can make one suffering from altitude sickness feel instantly better. 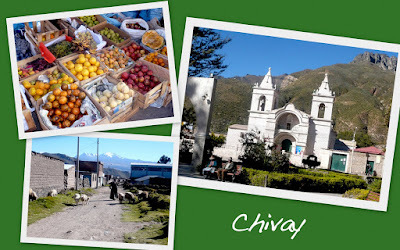 Having sipped some tea, we proceeded on to the town of Chivay, steeped in the Colca Valley. We had a nice lunch buffet, and then could wander off on our own to explore the area. Chivay is a quaint little town that is proud of its Quechua culture. There were the locals clad in their trademark hats, long skirts and braided hair, going about their own business. At the bazaar, people were busy selling all kinds of fruits, vegetables and handicrafts. Kids with dark pink cheeks were happily running about, eating ice-cream and accompanying their moms or grandmas to go shopping. Within just a few minutes, I could understand the day-to-day lives of these people. The elders seemed to be quite reserved, yet humble. Maybe they were just not used to strangers coming to their hometown. I found out later on that the Quechua people are very protective of their culture and way of living, hence this part of Peru is quite different from the rest. That evening, we went to a hot spring, and it was simply great. 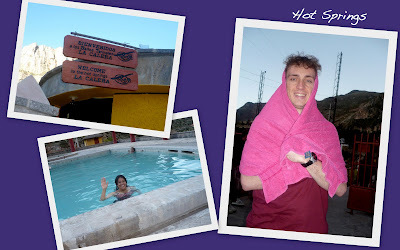 I loved being in the hot spring while being enveloped by the mountains of the Colca Valley. After spending a good hour or so there, where David ended up looking like a pineapple (see photo! ), we made our way to a local restaurant for dinner, where we were well entertained by Peruvian musicians and dancers. 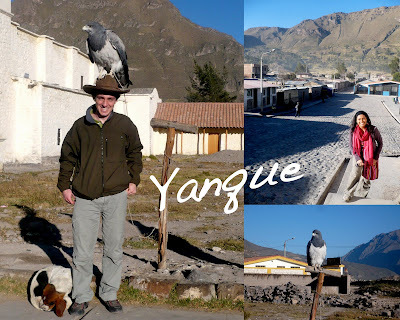 The following morning, we headed off to Yanque, a town similar to Chivay but less populated. When we got there, I spotted a gigantic eagle peacefully sitting on a wooden post. It looked so, so beautiful. I encouraged David to pose with the eagle (didn't have the guts to do so myself! ), and he let it sit on his head! How often do you get to have an eagle on your head!?! 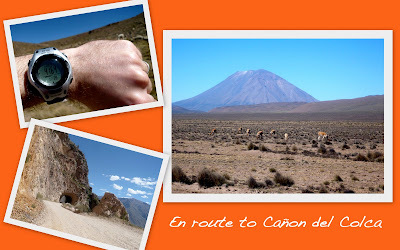 We then went into Canon del Colca, where we were to watch condors flying over the canyon. These massive birds looked so majestic with their wings spread large as they flew randomly over the valley. It was such a beautiful sight! 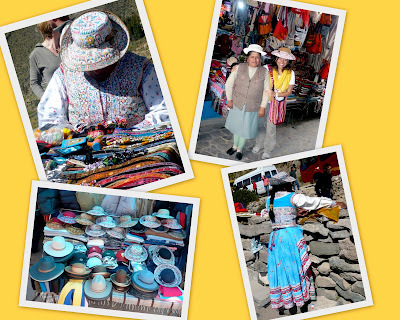 Nearby, Quechua women were selling traditional shawls, bags, purses, and snacks. For a moment, I thought about my tiny office in a cramped space, and envied these women for the wonderful natural surroundings they were working in. We walked into certain parts of the canyon, and I was so captivated by the beauty of the whole place. 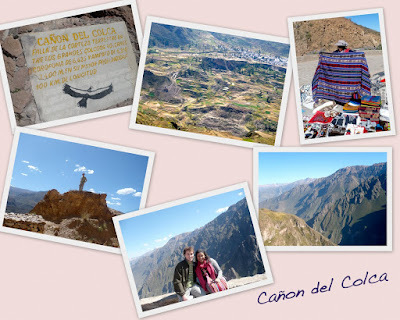 The Canon del Colca is supposedly the second deepest canyon in the world, even deeper than the Grand Canyon. It was so lush and green. There were so many cactus plants around and at one point, I even spotted a cute little rabbit chewing on some leaves. After lunch, we left the Colca region and headed back to Arequipa in the evening. So far, I had a great start to my dream vacation. The beauty of the Colca region is so difficult to describe, you've just got to be there to know what I mean. I hope the below video helps you to understand that! For the longest time, I'd wanted to go to Peru. There's just something about this South American country that kept me mesmerized. Maybe it was the mysterious Machu Picchu. Or it could have been the paradise that Lake Titicaca is. It might have even been the colorful clothes and smiling people I saw so often on travel channels. Whatever it was, I knew that I just had to see and experience this country for myself. I chose to go to Peru for my honeymoon as I didn't want the typical beach destination. I was seeking a totally different experience - adventure, history, local culture and traditions, interaction with the natives, food, music and nature all rolled into one. Peru fit my needs and interests perfectly. It was also the first time I was to set foot into South America. I booked my flight tickets on Iberia, the Spanish carrier, which offered the most convenient route: Geneva-Madrid-Lima. As the major sites in Peru are all spaced out, I figured the best way to travel within the country would be by flight. Afterall, I was only spending 2 weeks there, and driving from one city to another would have been way too time consuming. A Peruvian friend helped a great deal in organizing the trip, which we were doing completely on our own, without an agent, and she suggested that we book our domestic flights with LAN. This proved to be a fantastic idea as it was surprisingly one of the most efficient airlines I have ever flown. Also, we booked most of our accommodation at Casa Andina, and this too ended up being a great experience. I'm leaving you with a glimpse of Peru for now, and will be back with more details of each segment in different entries. Switzerland is renowned for its picturesque beauty: snow-capped mountains, beautiful lakes, quaint little towns and pretty chalets. One more thing to add to that list is its world famous chocolates! Any tourist wouldn't leave Switzerland without trying its chocolate and I don't blame them! Although I live here and absolutely love chocolate, I don't really eat that much of it here, but I always love looking at the chocolate displays at the chocolateries in the old town. 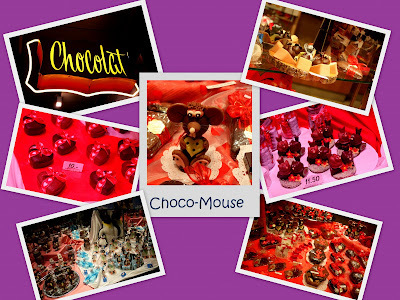 Since it was Valentine's Day last Sunday, the chocolateries went all out and used all their creativity to come up with yummy chocolate goodies. Check out these super cute themed displays! I am so in love with these chocolate figurines that I am tempted to get some for myself this week! If you ever get tired of eating Swiss food while you are here, I strongly suggest that you try Parfums de Beyrouth. 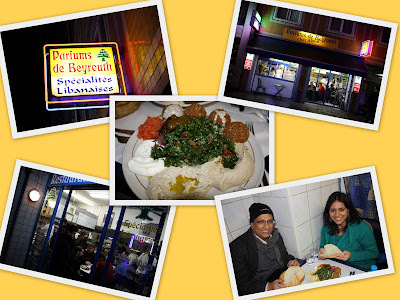 This small restaurant offers the best Lebanese food, friendly staff and quick service. Perfect for someone who is on the go. They do have a small dining area, but it is very cramped. The place is always packed with people, which only means that the restaurant is doing very well. My dad came for a short visit recently and since he loves felafel, and also as it was a Friday, I decided to take him to Parfums de Beyrouth as an F² experience. He really loved the food! If you are in Geneva, do check out this place. They don't have a website, but it is fairly easy to find. The restaurant is located in Paquis, not too far from the main train station. There are several Lebanese restaurants there, so make sure you go to the right one! Do you love adventure and are not afraid to fall and break a nail (or maybe other things)? If you answer "yes" to the above questions, you would probably enjoy what I did with a bunch of friends here. A friend of mine had been wanting to go snow shoeing for quite some time and suggested that we pick a Saturday to do that in the nearby Jura mountains. 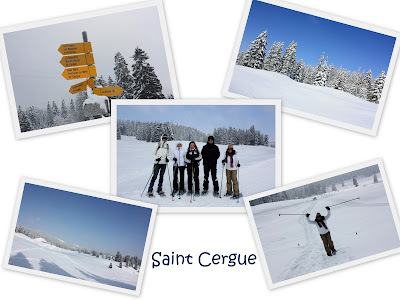 She organized a group of six of us to do it in the Saint Cergue resort, which is about 30 minutes by car from Geneva. You can also take a small train from Nyon. Off we went at 9am, loaded with sandwiches, fruits, juice and chocolates (that's right-food is always important!). We had to rent the snow shoes for 15 Swiss Francs (for the whole day) at a store in the village and then drove up to La Givrine, the starting point of the adventure. 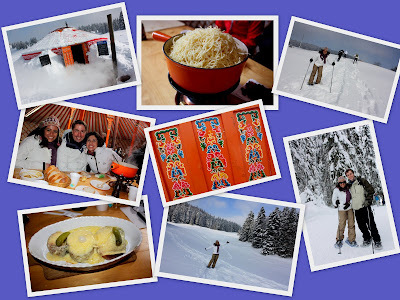 Our goal was to walk all the way up to a yurt where they were serving cheese fondue and other types of Swiss food. It was so, so cold!!! When we started off, it was -15 degrees! I could feel that my fingers, toes and nose were all getting frozen! In such situations, you really need a lot of movement so that you don't really feel that cold. Our small group walked with our snow shoes, which I think look like ducks' beaks, and headed off in the direction of the yurt. In between, us girls got a bit hungry and we made two stops for fruits and croissants. Although the sky wasn't so clear, we could see the sun peaking through, and it gradually started to show itself in its entirety. That made it easier for us to walk and the cold didn't bother us so much anymore. After about 1hr 20mins, with a few snowball fights in between, we finally reached the yurt. I really liked the yurt. It gave the area a Central Asian vibe. We were lucky to find a free spot inside, and were told that everything would be self-service. I didn't want to have cheese fondue, so I opted for a vegetable soup and a croute au fromage which is toasted bread baked with swiss cheese. As the yurt had opened only recently, I didn't find the organization to be very good, and we were left confused as to what was self-service and what wasn't. Those who chose to have the cheese fondue were told that they should make it from scratch at the table. That was so fun. We were provided with grated cheese, and we dumped it in the pot that was slowly heating up. It took a while for the cheese to melt, and we had to keep stirring it. An interesting tip provided by our Swiss friend was that you have to stir the cheese in the way you write "8". That's the way the Swiss do it, and you have to listen to the pros! It was good fun eating in the yurt-definitely a unique experience. We finished off our cheesy meal with some nice chocolates and then headed back the same way to Saint Cergue. Although I am not a fan of snow and winter sports (I am the type who enjoys looking at snow while being indoors), I must admit I had a lot of fun. Adventure. Check. Good food. Check. Great company. Check. What more could one ask for?! I got home and went directly to bed. I needed some good ol' afternoon siesta! If you do come to Switzerland and want to try another sport besides skiing, this is it! Do check the website though for other fun things to try, like Nordic skiing! Until recently, Edelweiss referred to the song of the same name in Sound of Music. Now, however, Edelweiss has a whole new meaning to me, and signifies fun, excitement and great food! 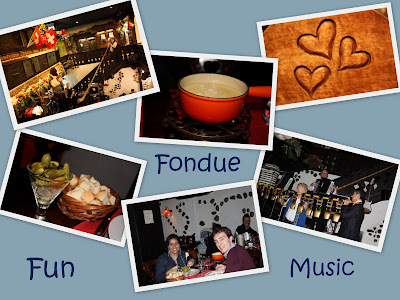 Recently, my colleagues and I were talking about good fondue places in Geneva, and they kept referring to a certain Edelweiss Restaurant. This restaurant is located in the Paquis quarter of Geneva, and I couldn't believe that I had never been there before, as I used to live so near to it! My colleagues talked so enthusiastically and I felt the urge to check out this place immediately. I quickly made dinner reservations for that very night (it is better to make reservations, as the place gets packed rather quickly), and I was thrilled to find out they could take us in. What's more, it made for a great F²! The restaurant is situated in the Edelweiss Hotel, along Rue de Paquis. 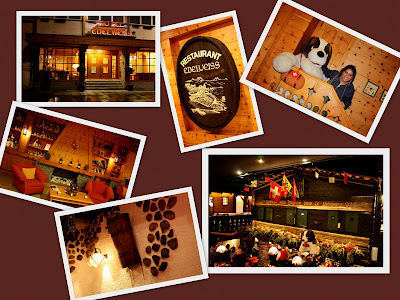 While the exterior doesn't look that attractive, once I entered, I could instantly feel that I was in a typical Swiss chalet: I was greeted by a huge St Bernard dog stuffed toy, the light wood interiors and of course the strong smell of the cheese fondue. As I walked in, I noticed the fireplace in the hotel lobby which made the entire place look so cosy. I proceeded on to the restaurant area and saw that there were a couple of old men dressed in Alpine attire, ready with traditional Swiss musical instruments to entertain us away. The interior decor was also very pretty, with red and white napkins and wooden furniture. I ordered the Fondue Neuchateloise along with some pickles and small onions and impatiently waited for the food. In the meantime, the two old men were singing and yodeling while playing their different instruments. The whole ambience was so lively, jolly and wonderful. I loved it! To top it off, the service and food were great too. I had such a fun time and I was so happy that my 2nd F² had been a great success*. If you do come to Geneva, and would like to try some typical Swiss food, be sure to eat at the Edelweiss Restaurant! *My first F² was watching the light hearted comedy, It's Complicated, followed by hanging out at the Saveurs & Couleurs Cafe that's on my street. It was great, but I don't have any photos of it :(! Who Wants to Join Me On My F² ??? Curious John: F²? What's that? Preethi: Never heard of it? Curious John: Nope, never, but I am dying to find out! Just tell me, already! Yes, that's right! 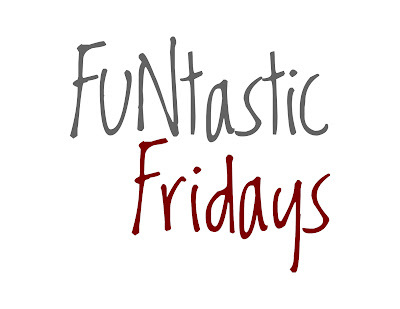 Let me tell you a bit about FUNtastic Fridays, or F², as I call it. I have been living in Switzerland for many years now, and despite that, I feel that I am still not used to the slow pace of life here. That's because I spent much of my life in Singapore where you wouldn't even notice the minutes go by. So, after my university friends left Switzerland, I ended up being one of the very few ones left here and started to feel a bit lonely. Then came the complaining. As wonderful as Switzerland is, I somehow always missed my faster paced life in Singapore. Well, in 2010, I decided to stop complaining and do something about it. I realized that I wasn't being fair to Switzerland, and I wanted to give it another chance. I often heard from friends and acquaintances that there are in fact many things to do, but you need to dig deeper to find out what they are. That's exactly what F² is about. Since the start of this year, I am specifically making it a point to do something on Friday nights. For me, it's the best day to do it as I put an end to a stressful week at work and I can cool down and welcome the weekend. Most importantly, with F², my goal is to discover more of Switzerland, go to places I have never been to before, try out new things and have FUN. I have done it thrice so far, and I can tell you that it's doing wonders. I have infact discovered more places in Geneva and am now constantly on the lookout for events taking place in the region. I will blog about my F² every week, and I hope that those of you who live in Switzerland or plan to visit it in the near future will find my tips useful! Preethi: So, what do you say, John? Would you like to join me on my F² tomorrow? Curious John: You bet! I just can't wait for tomorrow now! Alright, folks, I am off to have some fun tomorrow! Ciao! In between all my sightseeing, I managed to squeeze in some time to try some good food, do some shopping and even got henna done on my hands and legs! I was so thrilled that I got to eat my favorite Indian food again and especially enjoyed the food at a Punjabi Dhabha in Amritsar. It was so delicious! I was also excited that I got to eat at Saravana Bhavan after a long time. 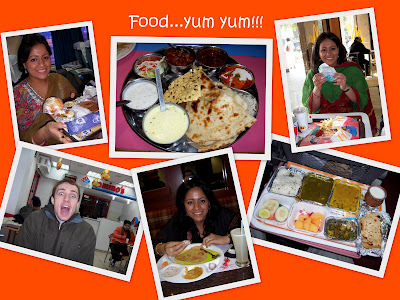 After eating Indian food continuously for days, as good as it was, David and I were craving other more "western type" food. So towards the end of our time there, we ate at Pizza Hut, McDonald's and Domino's Pizza. I am not too proud of myself for doing that, but I couldn't think of anything else to appease David, as you can see he was starting to become crazy already! Haha, I'm kidding. It's just that I don't think anyone can quite handle eating the same aaloo paratha for breakfast every morning, and the same type of food day after day. Need to mix it up a bit from time to time! I also bought some houseware things in Janpath after some bargaining with the lady in the photo. It turned out to be quite easy as there was a lot of competition between the vendors, and sellers were just shouting out any prices that came to their minds to attract us. It was quite amusing to watch all the bickering. Anyway, I walked off very happy with my purchases. I wanted to have henna done in Delhi, so I managed to find a sweet lady and her family to do it for me in the Hanuman temple district. This place is apparently famous for henna art, and there is an entire row of local women designing tourists' hands and legs with henna. Although the lady told me the henna would last 20 days, it was gone within just 3 days. So, it ended up being a slight disappointment. I have now come to the end of my North India posts. Do hang in there though, as I will be back with more exciting adventures in other regions! While the Mughal emperors are most famous for building the Taj Mahal, they also left behind several other treasures such as I'timād-ud-Daulah's Tomb, also known as the Baby Taj, Agra Fort and the magnificent palace in Fatehpur Sikri. 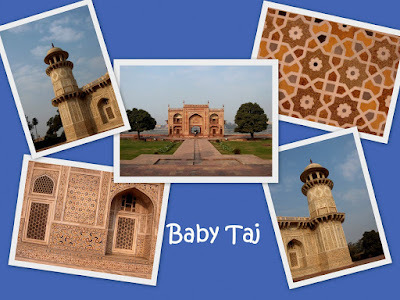 The Baby Taj was commissioned by Queen Nur Jehan, whereas Agra Fort and the palace in Fatehpur Sikri were established by King Akbar. What I found so special about these buildings is the way Kings Akbar and Shah Jehan incorporated different elements of Hinduism, Buddhism, Jainism and Islam into their design. For instance, ceilings and walls even had the Hindu symbol of a lotus! I loved all three sites. There is something so enchanting about these places that it almost felt surreal. A lot of Mughal buildings were built using red sandstone, which immediately gives them a regal look. On top of that, these buildings have so many intricate designs carved on marble that one can only imagine how it was even possible to do it at that time. The Agra Fort is a vast area where King Shah Jehan was placed under house arrest by his own son, Aurangzeb. My heart went out to him as I walked around the areas where he was confined. From the Agra Fort, I was also able to enjoy fantastic views of the Taj Mahal and the Yamuna River. I then went on to visit the Baby Taj. In terms of architecture, this was my favorite. The mausoleum features very detailed marble carvings engraved with precious stones, and was very impressive to look at. I felt that the Baby Taj presented more detailed designs than the Taj Mahal itself. In fact, it is believed that it was built as a model for the Taj Mahal. 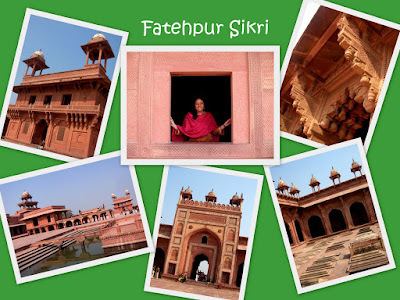 The final stop in my North India trip was Fatehpur Sikri. I simply could not get enough of this place. The palace is one of the most beautiful red sandstone buildings I have ever seen. The whole compound is very vast, with lots of interesting sections to explore. There are also numerous tombs within the compound and Muslim devotees can enter the tomb of Salim Chisti to seek the saint's blessings and fulfil their wishes. People of any religion can also enter, as long as they cover their heads, and make a wish by tying a thread on the marble screens of the tomb building. Once their wish has been fulfilled, they can remove the thread, which symbolizes their wish. I was approached by a young Muslim boy, who offered to take me to the marble screens to tie a thread. I happily tied the thread while making my wish, as you can see in the video. I hope it will be fulfilled! After an eventful day in Agra and Fatehpur Sikri, I headed back to Delhi, as my tour concluded there. All in all, I had a fantastic and unforgettable time in Northern India. Now, I am just waiting for the opportunity to visit the Ganges river, Calcutta and the eastern region! Hopefully, I get that chance soon! A new video of my Shimla adventure has been added right here! Do enjoy! You can also enjoy a visit to the Golden Temple by simply clicking here! You now have the opportunity to see the Attari-Wagah border parade! Click here to watch my video montage on this!